The best thing Major League Soccer got out of their new TV deal(s) last year with ESPN, Fox Sports and Univision was the regular time slots. The money is great (fine?) I'm sure, but judging by the new CBA it appears that most of that dough is earmarked for things not directly related to league operations. The reason I like the regular slots is a little bit different then you might think. Of course it does help to know that late Sunday afternoons and evenings have a couple games on, but really, it's just that. A couple games are on. MLS wants so badly to be the NFL but they can't seem to work that out. One of the key ingredients of regular time slots for the NFL is that just about every team is playing at the same time. It's a gridiron explosion. Same thing with the college guys on Saturdays. Fans bask in the shared moments all across the country. So, no. Or yes. Whatever. 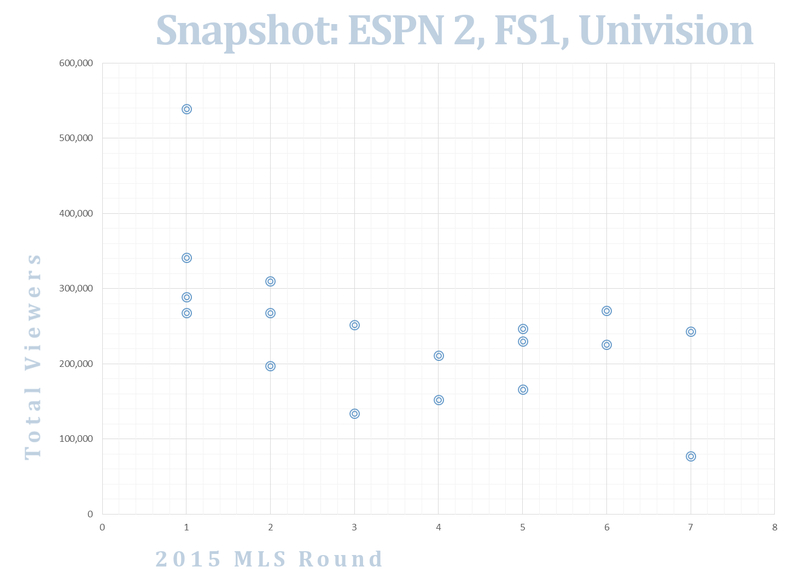 Having consistent slots is good for MLS, but it's so paper thin. The Real Reason MLS coming on every Sunday (and Friday evening, and on the same channels) is because it improves the system by which we measure improvement (and failure). In the past, MLS had games on the same channels, but the times jumped all over the place. Sure, ratings best compare to PBA Bowling, the WNBA and college softball but there was no way nailing down exactly where the league stood. With time slots floating all over you have a lot of noise. Maybe a game between LA Galaxy and Portland with an EPL lead in bumps ratings or how about a lonely Saturday night matchup in the fall between Colorado and DC United. I'd be working long hours trying to sort that out if I were a television industry professional (it'd probably include lots of calls to the local PR firm as well). With these consistent MLS slots we can now more clearly see what is going on. The way it was best described to me during a Kaisen event many years ago was "being able to see all the rocks when the tide is low." What that means is removing as much clutter as possible (like a 5S) so see where the issues and challenges might be. For as long as I've been paying attention, Soccer has always done pretty well on the small screen while at the same time MLS has always had a TV viewership issue. Excuses are many. Leading the list has always been time slots. Followed closely by quality of play, American's general hate for soccer, it's just too boring, broadcast quality (announcers, commentary, camera angles), league structure (single entity), etc... Along with the success of the English Premier League on NBC Sports - this deal wipes out many of those and will force the league to address some challenges they might not do otherwise (quality, league structure being the two big items). Millions (and millions): NFL. A regular Sunday afternoon matchup can top 10 million. The NFL juggernaut (preseason games get over a million). Millions: NCAA College Football. Millions: NCAA March Madness Final Four type games. About a Million: NBA and NHL regular season games. Close to a million: MLB games across poplar channels. Keep in mind the length of NBA, NHL and especially MLB. Next up is English Premier League on NBC Sports and Real Madrid, Barcelona types on Bein Sports. These games tend to draw somewhere between 500-800k (El Clascio draws over 2 million). F1 and NASCAR racing sort of bounce between top tier and this 2nd group. Outside of those guys fall the lower tier sports (3rd tier). WNBA, Bowling and MLS all fall around the 250-350k range on channels like ESPN 2 and Fox Sports. 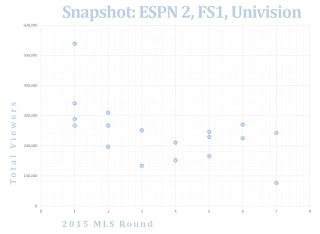 The Challenge for MLS going forward will be to break free from the bottom group. The EPL on NBC has proven that it can happen for a soccer league and not just the World Cup. How that happens is something MLS has to figure out. Ratings might stink (they do) but now at least they know a few of the reasons why they do. They might not like what the see but hopefully they work on that.